Thrustmaster’s Modular Hydraulic Outboard Outboard Propulsion Units are self-contained azimuthing thruster packages available from 300HP (225kW) to 3,000HP (2240kW) for main propulsion and positioning of barges, workboats and river craft. The transmission of each thruster is a hydrostatic drive – a smoother, more reliable alternative to mechanical transmissions. In a hydrostatic system, gears, drive shafts, bearings, clutches and other complicated parts are replaced with simple hydraulic hoses and fluid. The hydraulic drive acts as a torque converter providing unlimited propeller speed control while protecting the engine from overloading. The engine runs at constant speed, just like a generator. Full engine torque is available at any propeller speed. 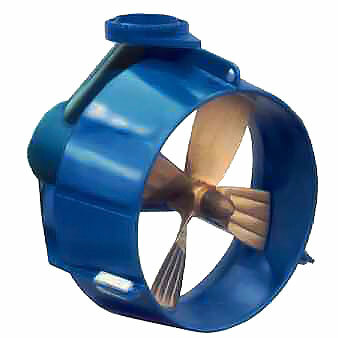 The propeller shaft is directly driven by a hydraulic motor in the pod (the lower foot) of the unit. 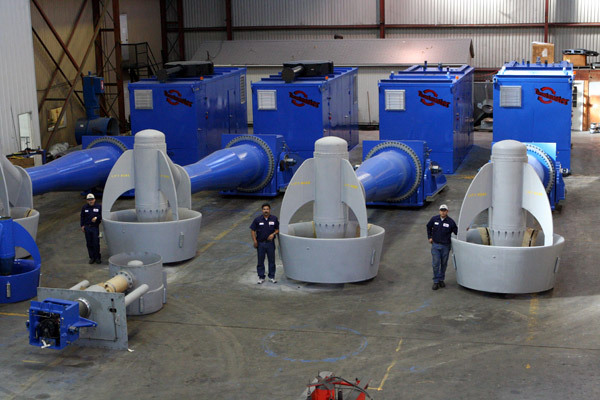 Rotating inertia is limited to the rotor of the hydraulic motor, the propeller shaft and the propeller itself. 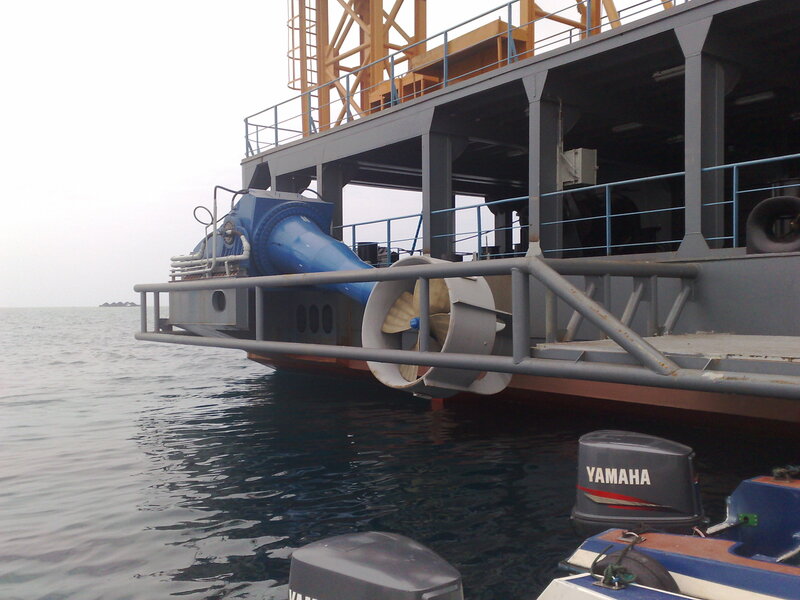 By virtue of this very low rotating inertia, the hydraulic drive easily absorbs the shock whenever the propeller hits bottom or is blocked by a floating log or other obstruction. The shock is further limited and dampened by pressure compensation and hydraulic reliefs. Modular Hydraulic Outboard Outboard Propulsion Units preserve functional deck space by allowing the engine to be installed remotely on any vessel. Their versatility enables a single engine to power multiple outdrive propulsion thrusters at the same time. 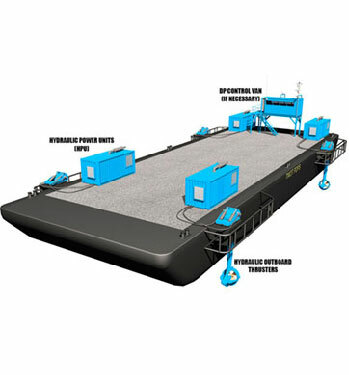 The propulsion unit allows for easy configuration to suit any size vessel or barge from 100 to 600 ft (30 to 180 m) long, with freedom to place modules wherever space is available. 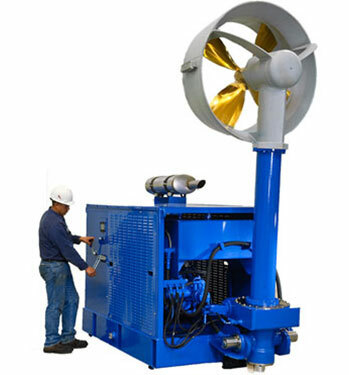 No vessel conversion is needed to create new engine rooms for generator sets and thruster rooms for thu-hull thrusters with the deck mounted thrusters and power units. Thrustmaster’s hydrostatic transmission pump is the powerhouse of the hydraulic system. The engine is directly driving the pump - not the thruster. 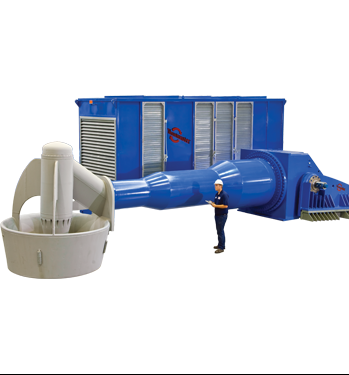 This pump controls the thruster through infinitely variable displacement. This means the propeller speed can be accurately controlled anywhere between standstill and maximum, both forward and reverse, without altering engine speed. From full forward to full reverse in five seconds. 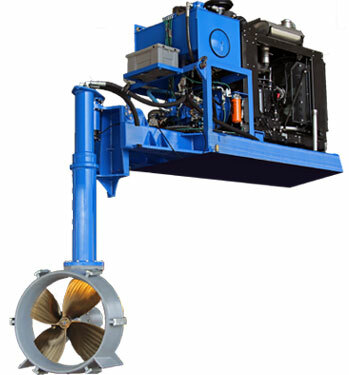 A hydraulic power tilt system capable of elevating the outboard drive assembly through an arc of 90°. 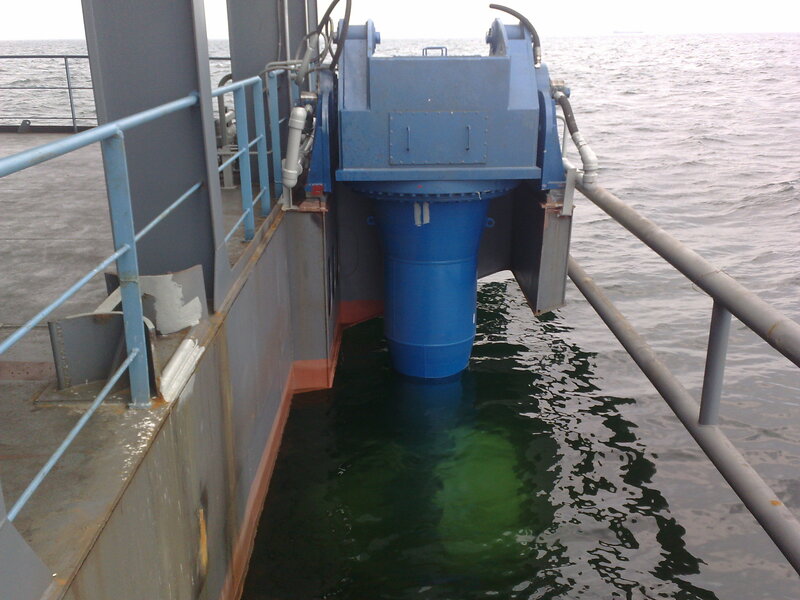 This allows instant access for clearing of ropes or fouling the propeller. The tilt system incorporates relief valves that allow the outdrive assembly to kick up in the event it encounters a subsurface obstruction or in the case of grounding. Modular thrusters are a key component of Thrustmaster’s exclusive Portable Dynamic Positioning System. 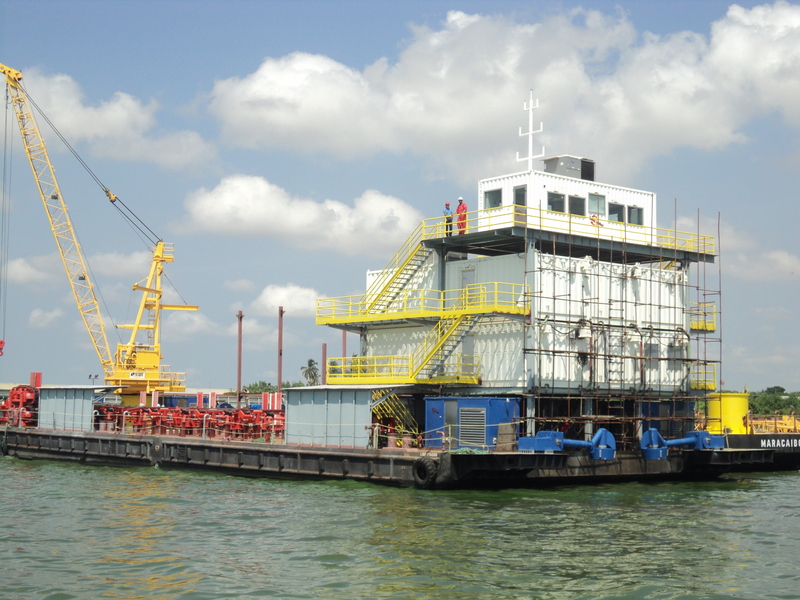 The portable dynamic positioning system makes affordable and quick dock-side conversion of any vessel to DP-0 thru DP-3 per any of the major classification societies.